Battlefield V has axed the Battlefield Premium Pass, opting for a free live-service model. Tides of War will bring players a post-launch campaign, while Firestorm will function as the game’s battle royale mode. Now, a detailed roadmap going over the first three month’s after the game’s launch has been released by EA. It all kicks off with Chapter 1: Overture, which will take place in early December 2018 and run through January 2019. The first chapter of Tides of War, The Last Tiger, appears two weeks after launch and explores the German perspective. But this narrative is no hero’s story. 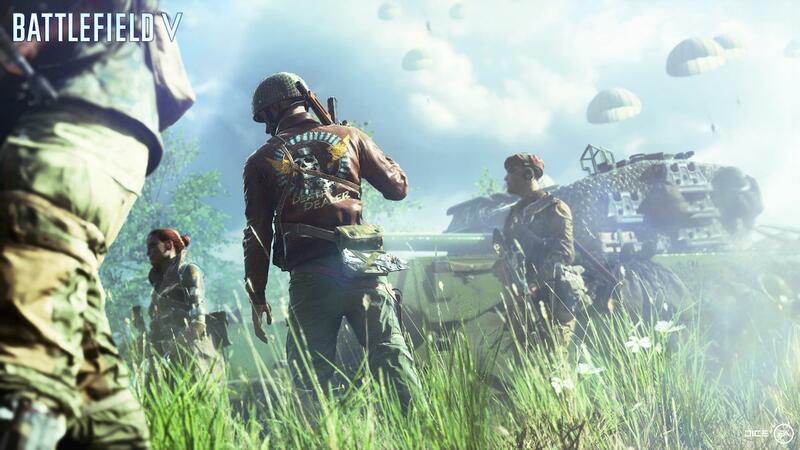 Practice Range will also appear in Battlefield V, allowing players to hone their skills with “trials to work on your shooting, driving, and flying.”Lastly, Overture adds vehicle customization options, a tank focused arena with the Panzerstorm map, and the start of weekly events and rewards. The next step is Chapter 2: Lightning Strikes, which has a January 2019 until March 2019 window. Combined Arms allows you to join up to three friends for a series of co-op, Combat Strike missions across several maps, facing off against AI. Lightning Strikes and a revamped Rush mode both become available. And Squad Contest, with 16 players and two squads per team, will have you fighting for control of the map. Tides of War continues as does weekly events and rewards. After that, March 2019 will bring Chapter 3: Trial by Fire. Battlefield V‘s battle royale mode, Firestorm, enters the arena. The mode adds the shrinking map mechanic to trademark Battlefield elements. A Greece map is added, with a focus on aerial combat. Meanwhile, the third chapter of Tides of War releases as weekly events and rewards continue. New Experiences: Play through a new single-player War Story dubbed The Last Tiger, co-op with a friend in Combined Arms, do battle royale the Battlefield™way in Firestorm, experience new game modes and Grand Operations, and hone your skills in the upcoming Practice Range. Battlefield V will come to the PlayStation 4, Xbox One, and PC on November 20, 2018.